It looks like Sony is very serious when it comes to producing high-end tough phones, the company just announced the Xperia ZR that wants to go for a swim with you. 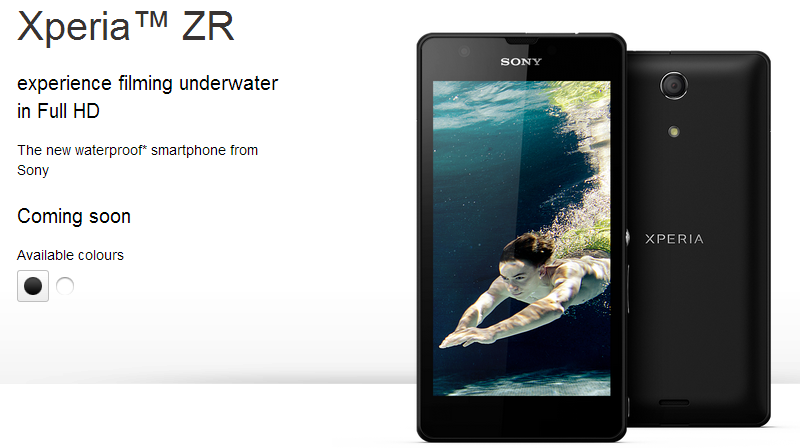 Boasting the ability to let you film under water in Full HD, the Xperia ZR is a waterproof smartphone that can be submerged under 1.5m of water; that’s even more resistant than the Xperia Z. Beneath the 4.55” 720p shatter proof display, the Xperia ZR comes packed with a 1.5GHz Qualcomm Quad-Core processor on board, 2GB of RAM, and runs on Android 4.1. It features a 13MP fast-capture camera with Exmor RS sensor and a whopping 16x digital zoom. Other specs include 319ppi display, Mobile Bravia Engine 2, NFC and LTE connectivity on board. No further details have been revealed regarding pricing and availability, the device is listed as “Coming Soon” on Sony’s website. Check out Sony for more information or catch the YouTube ad right below.